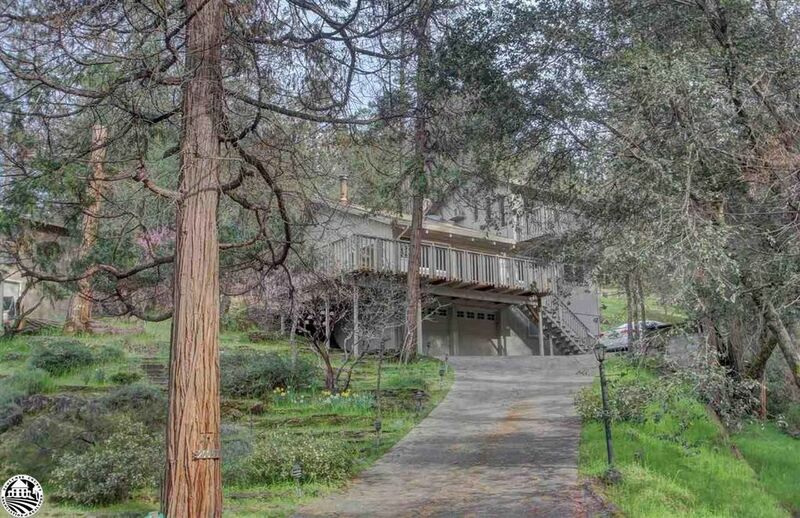 Lake View Cabin Getaway on beautiful up sloping lot set into the hillside for premium views. This quaint cabin is tucked back on private 1.31 acre terraced lot with a lavender, manzanita, red buds and daffodils adding bursts of color. On the western border of the property is an amazing cascading seasonal creek carved in rock over time. Picture windows in the living room, front bedroom and master bedroom frame the lake views. Enjoy morning coffee on the front deck and breath in the natural beauty of this unique property. The three bedroom floor plan includes a den off of the third bedroom, and a bonus room downstairs, off of the two car garage. Located in the gated resort community of Pine Mountain Lake. Amenities include a pga rated 18 hole mountain golf course with pro shop, tennis and pickle ball courts, equestrian center, swimming pool, recreational lake, Country Club with fine dining and cocktail lounge, archery, hiking trails and more.